7 questions we have about the 2017 Colorado Rockies - Denverite, the Denver site! Here are seven things we’re wondering about as the season gets going. Apr. 03, 2017, 6:00 a.m. Baseball is officially back. The Colorado Rockies open their season at 12:10 p.m. today against the Milwaukee Brewers. For the first time in a while, there’s genuine optimism surrounding this team. They’re one of the internet’s favorite dark-horse teams to contend for a playoff spot. Here are seven things we’re wondering about as the season gets going. 1. How good can Jon Gray be? 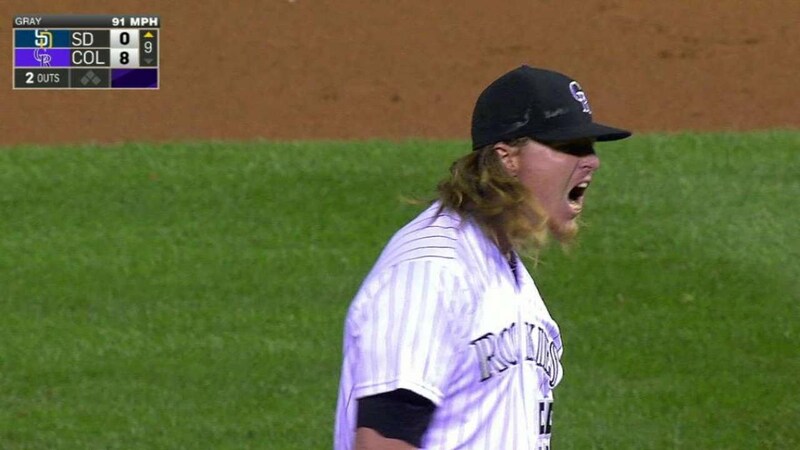 In 2016, Gray set the Rockies’ rookie strikeouts record by fanning 185 batters. He ranked ninth in the MLB among all starting pitchers with a 9.91 strikeout rate per nine innings. Gray had his ups and downs, which is to be expected from any young player who pitches half his game at Coors Field. But there were times when he looked every bit the part of an ace. D.J. LeMahieu called Gray’s 16-strikeout, complete-game shutout of the Padres “hands down” the best game he’s ever seen pitched at Coors. Gray set a high bar for himself as a rookie. How will he fare with the added responsibility of being asked to anchor this staff? 2. How will the back end of the starting rotation hold up? You’ve got to feel pretty good — well, about as good as someone who follows the Rockies can feel — about Gray, Tyler Anderson and Tyler Chatwood in the first three spots. What about those last two spots? The Rockies are rolling with 23-year-old Kyle Freeland and 22-year-old Antonio Senzatela. Neither have a lick of big-league experience. Freeland, a Thomas Jefferson High School alum, split time between Double-A and Triple-A last season. Senzatela was in Double-A Hartford all year. 3. Can Charlie Blackmon and D.J. LeMahieu keep it up after career years? Blackmon and LeMahieu both played the best baseball of their lives a season ago. Blackmon slashed career highs across the board (.324/.381/.552) while hitting 29 homers from the leadoff spot. LeMahieu, who batted right behind Colorado’s mullet-ed wonder, won the National League batting title with a .348 average. He ranked first in the MLB in contact rate (90.2 percent) and was an opposite-field-hitting machine. How much regression — if any — are both due for? 4. What can David Dahl do over a full season? Saying David Dahl’s MLB career got off to a good start is an understatement. Dahl debuted on July 25 and immediately ripped off a 17-game hitting streak. He ended up hitting .315 with seven home runs and 24 RBI in 63 games. Dahl, who turned 23 today, looks like a legit five-tool player. He’s still recovering from a stress reaction in his sixth rib but should be back soon to take over the starting spot in left field. I can’t wait to see what he does in a full year. 5. Will the bullpen still be a flaming pile of garbage? Theoretically, no. The Rockies, whose bullpen finished with a league-worst 5.13 ERA, dug deep into their coffers to sign relievers Mike Dunn (three years, $19 million) and Greg Holland (one year, $7-$14 million depending on incentives). Add those guys into the mix with Adam Ottavino, Jake McGee, Carlos Estevez, Jordan Lyles and Chris Rusin, and it doesn’t look like an awful unit. “It’s sort of a real bullpen,” Rockies manager Bud Black said during spring training. That’s a ringing endorsement if if I’ve ever heard one! Holland hasn’t pitched in an MLB game since he underwent Tommy John surgery in the fall of 2015. McGee’s 2016 season went off the rails as he dealt with knee issues. How each bounces back will go a long way in determining how much improvement this ‘pen can make. 6. How will Ian Desmond hold up at first base? You probably know by know that the player who Jeff Bridich handed a $70 million contract this summer to play first base has never played first base in his life. We’re going to have to wait a little while for Desmond to debut at his new position; he fractured his hand in spring training and is still on the mend. It will be interesting to see how he adjusts when he returns. Mark Reynolds is set to fill in for Desmond there in the meantime. 7. Will Ian Ian Desmond even finish the season at first base? Merely speculating here, but I have a hard time believing that when Desmond signed that mammoth deal, the Rockies envisioned him playing the majority of his games at first base for all five years of his contract. There were several other cheaper alternatives out there with better power-hitting numbers. I wouldn’t be shocked if a mid-season trade leads to Desmond shifting back to his old home in the outfield. Carlos Gonzalez is an unrestricted free agent after this season. Blackmon is an unrestricted free agent in 2019.